OK, day 3 of this crazy challenge, (who's idea was this anyway!?). 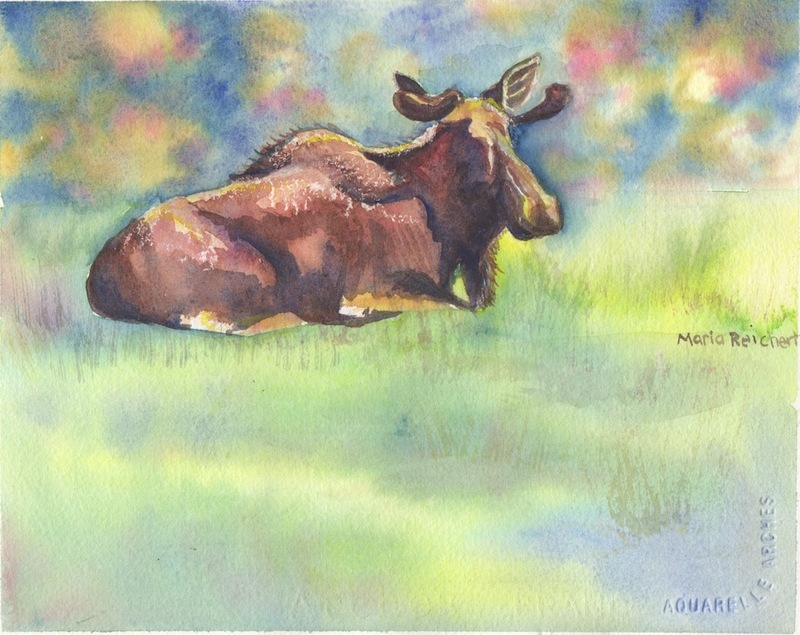 I painted this moose laying in the grass. (OK, the moose was in the grass, not me, our grass is way too snowy). I went a little crazy with the color but to be honest, I like this one better than yesterday's painting. More colorful, better value changes, my photo reference was not excellent so some details are fuzzy, and my moose anatomy skills are weak at best, but better than yesterday....let's see how tomorrow goes! I like your moose, too. Tomorrow I am going back to paint a horse, I know that anatomy! Thanks for visiting, I appreciate your support, especially this month. You are doing great with your challenge! I like this moose a lot. The contrast of light and dark on the moose is great and I like the colors in the landscape, too! Theresa, I knew my zoo photos would come in handy one day! Thanks for being so supportive. Can't wait to see your horse today! I am working on a plan for my 4 day weekend in Cincinnati. I know I won't be painting those days, so I think I will be working on a series and post all four at once. We'll see. I have a weekend this month that I will be away as well, and I am hoping to sneak in a few extra paintings before that, but it certainly won't help if the kids are home from school any more this month.....I thought February was supposed to be a quiet month! Well at least February will go quickly, we will be so busy!